Hasn't the weather been beautiful this week, so warm and sunny and it's supposed to last until Tuesday so I hope everyone has a lovely weekend. This is beautiful Pat… I love the fab Topper and the paper matches beautifully… gorgeous colours! This is gorgeous Pat, I love the topper and beautiful colours. What a wonderful THANKS! Your whole card looks great! 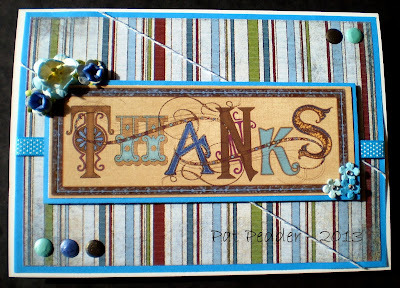 Great card hun, love the colours & the topper is perfect as are the embellishments you have used! LOVE the sentiment! Just beautiful! Fab card Pat - love the colours.